I had this written to be posted on Friday but as my luck would have it I spent Friday night at an emergency room with a sprained ankle (from volleyball) that was swollen like I had couple of baseballs in there. Luckily, I didn’t break anything. Thanks to my friends, the 6 hours we spent there wasn’t all that bad. I got this cool LED Faucet Light at ThinkGeek.com with a gift certificate I won in a T-shirt slogan contest. That’s right not a wet t-shirt contest but a t-shirt slogan contest. My winning slogan: RSS Feeds. I’m Hungry! If you have seen someone wearing this, now you know the brilliant person behind it. Heh. 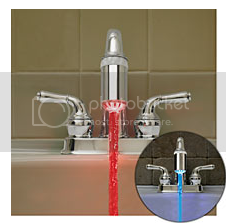 Now let’s talk about the LED Faucet light. It has a temperature sensor and the LEDs turn blue if the water is cold and red if the water is hot. Unlike other product pictures, these LEDs are really bight and you clearly tell the colors even in bright day light. We have made a few of our guests jump at night, when we made them turn the faucet on in total darkness. It’s very functional in kitchens and bathrooms. Plus, as the description at ThinkGeek says it looks like a futuristic alien mouthwash! They come with universal adapters & spare batteries. This is not a sponsored post. So if you buy it, you just end up with the keenest faucet on the block. 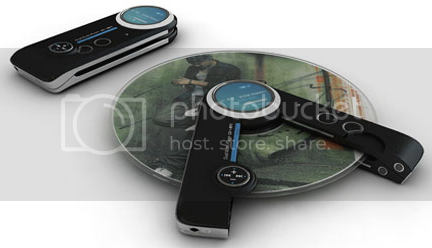 I came across this cool innovative design for a device that plays both MP3 & CDs at The Unprotected Blog! Whoever said innovation is slowing down? Hey, sorry to hear about the trip to the ER. Hope you’re able to get back to dancing real soon! Those are some pretty cool gadgets there! Those are sweet aren’t they! You need a private nurse while you’re recovering buddy haha. That CD player looks really good! Chris.. glad you like them! And I did email you back too.. let me know if re-adding the feed to your reader doesn’t fix it. LED ligths are really cool gadget. But what if you sometime would scare your faucet? Now those taps are pretty cool! They are a great idea, especially of old people or kids!